Narciso Rodriguez Bleu Noir is rich and sensual chords hypnotically. Narciso Rodriguez Bleu Noir 100ml. EDT is a very elegant and daring fragrance for men who are aware of their personal attractiveness. Set foot anywhere, they become a magnet for women. Carry your seductiveness to the absolute maximum with unique masculine fragrance by Narciso Rodriguez For Him Bleu de Noir! Fragrance Narciso Rodriguez For Him Bleu de Noir conceals a captivating woody and spicy tones that looks very manly and their intensity and subtlety is absolutely unforgettable. Cedar and ebony creates a very warm composition that is supplemented with nutmeg, cardamom and sensual musk. Men's toilet water Narciso Rodriguez For Him Bleu de Noir is perfect for day or evening wear in society. Experience sensuality fragrance Narciso Rodriguez For Him Bleu Noir and add sparkle to your style. Unusually elegant and seductive fragrance perfectly highlights your personality. Imagery of fragrance Narciso Rodriguez For Him Bleu de Noir also expresses great dark blue flacon, which symbolizes the attraction of the night. Deep and sensual eau de toilette has a delicate woody-spicy character. It is a stunning interpretation of popular perfumes Narciso Rodriguez for Him - retaining the velvety sound of the original, the new fragrance has gained intense, but at the same time lighter and softer sound. 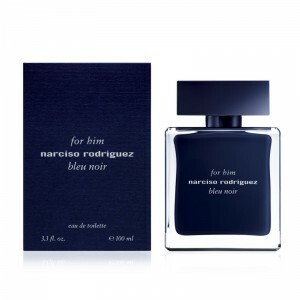 An updated version of Narciso Rodriguez for Him Bleu Noir appreciate, first of all, elegant and modern, mysterious and stylish men. Special Perfume differs deeply unique opening. From the outset, it envelops notes of cardamom and nutmeg. After some time, shades of cedar and musk come into the game of seduction. A completed sound a note of ebony, which is quite unusual for the base. According to the creator of Narciso Rodriguez, his next masterpiece exclusively personal and bold, incredibly fresh, mysterious and seductive, but at the same time clean and clear.